All too often, the holiday season can be a challenging time when it comes to body weight and body fat %. It is very common to hear individuals say, “I gained 10- 15 over the holidays!” No matter how frustrated individuals get with themselves when this happens and no matter how many times they tell themselves this will not happen again, it seems inevitable each and every holiday season. Let’s goal-set to take control and prevent this scenario from happening during this holiday season. One of the first steps to take is to change the mindset that “this is just the way it is, I always gain weight during the holidays”. If we believe this to be true, then it will become just that…a reality. We do not want this to become our norm. Unfortunately, this has become a societal norm, but there is no reason that we need to adopt this as ours. Let’s change the verbiage today: “I will maintain, if not even improve, my body composition during this holiday season.” Remember, if you believe it, you will achieve it (and this goes for the good and the bad). Not so fast! How many times do we hear individuals following a holiday splurge say, “I know I ate way too much tonight; I will just work out longer and harder tomorrow and work this off.” On the surface, this seems to make sense, as it is conventional thinking. Unfortunately, it’s much harder work to burn calories than to ingest them! If we go through the holidays with the mindset that, “If I eat more, I will just work out more”, we better get ready for some unwelcome body composition numbers. Always remember, we cannot out-work or out-train improper nutrition. Let’s set the stage…tonight you have a holiday function or party to attend. There is going to be great tasting food and beverage. You want to really enjoy this party, so, you choose to eat less during the day and “save-up” calories in order to enjoy all of the wonderful foods tonight. You get to the party and your plan has worked to perfection; you have definitely brought your appetite, game on! Sound familiar? If you have been in this situation before, you know exactly what the result is: nothing short of a feast for the ages. You’re ravenous and your hunger level seems to be out of control. 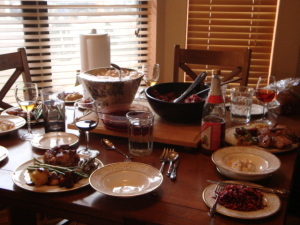 By the end of the party, your overeating binge is leaving you quite uncomfortable. In order to prevent this from happening, the key is to eat and fuel your body at the normal high frequency from the time you get up in the morning (and every 2.5 to 3.5 hours thereafter). This will leave you with normal hunger levels by the time the party starts, and you will be able to make smart food choices that are also enjoyable and of normal portion size. You can now enjoy the food at the party without the guilt. Who says you can’t have your cake and eat it too? Avoid the “make-up” as a continuation of the above scenario too. Let’s say you did save up calories that resulted in significant overeating at the party. You leave this party frustrated asking yourself, “Why did I let myself eat so much?” You wake up the next day and it is now time to beat yourself up and punish yourself for the binge eating the night before. In an all-too-normal reaction to holiday overeating, you choose to eat very little if anything for breakfast. It only makes sense that this is simply a numbers game: “If I ate too much last night, I will just eat less today in order to ‘make-up’ for last night’s disaster.” Sounds logical, right? Not so fast. As a result of trying to make up for the caloric overload the night before, eating less the next day through the early afternoon is going to leave you with extreme hunger. You tell yourself that you have really been “good” today by not eating much, and you are just trying to hang on to carry through with your low calorie day. Uh-oh. As the hours pass and dinner approaches, your hunger level seems to be out of control. You finish dinner around 7 PM hoping that your hunger has been satisfied. As the minutes tick by, you are still ravenous. The snacking begins and does not end until later in the night. What just happened? This was another binge eating session just like at the holiday party the night before and your mind goes to exactly where it was last night, “I will just make-up for this tomorrow.” Do you see the vicious cycle that has begun? In order to break this cycle, the key is to get right back to your normal nutrition, high eating frequency the next day immediately upon awakening. Feed the body properly no matter what occurred the night before, and you will keep the fire burning inside. It is time to start approaching the holidays with a different mindset. If you believe that weight gain is inevitable over the holidays, then this will become a reality…and the opposite is true as well. If you believe the holiday season will not have a negative impact on your body composition, this will become your reality. What’s your choice? Prove to yourself that you can enjoy the holidays while still maintaining, if not even improving, your body composition. If you believe it, you will achieve it, and holiday season nutrition success will be yours!